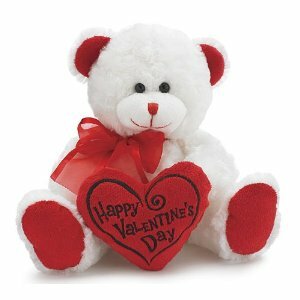 Thanks for visiting my hub on Valentine's gifts under $25. I'm certain that you will find lots of great gift ideas here for both your significant other as well as platonic friends. Bouquet of Glass Roses: A unique and stunning gift. Beautifully crafted, these glass rose, like your love, will stand the test of time. 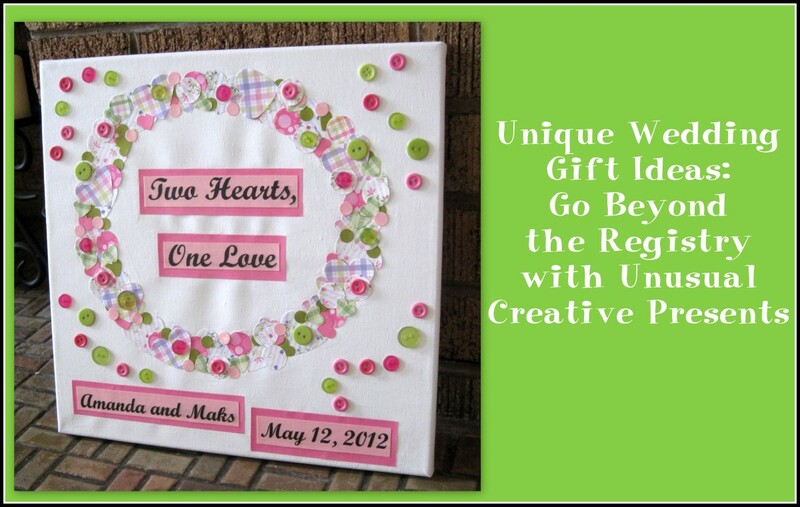 Moreover, they will let you express your creative side in providing your Mrs. 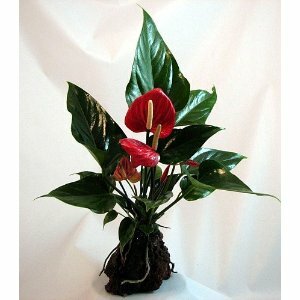 Wonderful with a traditional Valentine's Day gife (flowers) in a completely unconventional way. Heart-Shaped "I Love You" Pendant Necklace: Jewelry is another Valentine's Day staple that most men would do well to remember. However, you needn't look far to find something great, as this simple but elegant gift proves. Set in dazzling sterling silver, this eye-catching pendant says more than words ever could. Jumbo Coffee Latte Cup with T-Shirt: This oversized latte cup is just right for letting her know exactly how you feel. Covered in romantic Valentine's day hearts and accompanied by a lovely t-shirt with the same design, this lovely cup makes a perfect gift. Ghirardelli Valentine's Day Chocolates: It wouldn't be Valentine's Day without chocolate, and this beautiful, heart-shaped gift tin will attest to the fact. These elegant and refined treats will be something she unquestionably and thoroughly enjoys. 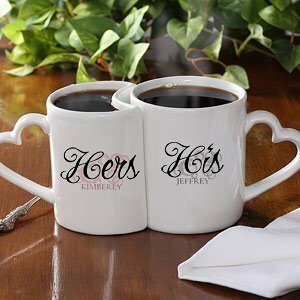 Personalized His and Hers Interlocking Mug Set: Simply put, this is an inspiring gift idea, with the interlocking mugs being reflective, of course, of your wonderful relationship. A touching gift, this singular mug set is also quite practical and will be a gentle reminder of you when he sips his monring joe..
Purple-Patterned Silk Tie and Cufflinks: Like women and shoes, a man can never have too many ties - especially those of this caliber. (So to the extent you were worried about that, don't.) There is no doubt that he will be completely enthralled by this gorgeous gift set, and it will probably become a staple of his dress ensemble..
Personalized Chrome-Plated Money Clip: It has been said that men love staking their claim to things - especially by putting their name on them. (That might be why married women have to change their name.) Thus, this charming, personalized money clip is sure to be a crowd-pleaser with men across the board. Duct Tape Roses: Duct tape is a product with applicability across a wide range of projects, so seeing it converted to flowers should not be as surprising as it actually is. Nevertheless, these exquisite roses are the type of flowers that men like to receive. He will thoroughly enjoy showing this gift off to his friends. Bubble Bath Roses: These scented, bubble-bath roses make for a charming gift. They will provide a wonderful bathing experience with senuous, aromatic bubbles, and are likely to prove more addictive than not. "Love and Hugs" Salt & Pepper Shaker Set: This uniquely original salt-and-pepper shaker set are both a delight to behold and a great conversation piece. 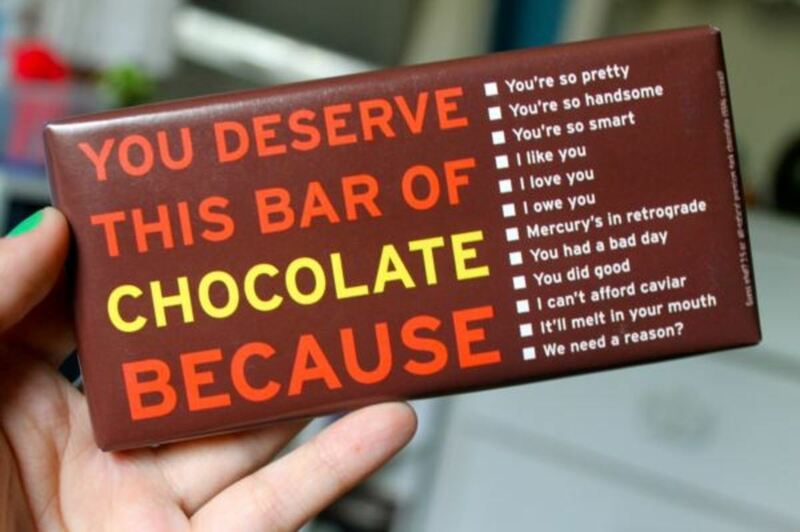 They make a perfect gift for just about anyone on your Valentine's Day shopping list. Ultimate Dealbreakers: What Will It Take to Make You Break Up? : We all know what dealbreakers are - those irritants, traits or quirks in a dating partner that are some disturbing or irksome that they make you scuttle the entire relationship. This book cites various dealbreaker scenarios with the ultimate question of whether you would consider it a dealbreaker. 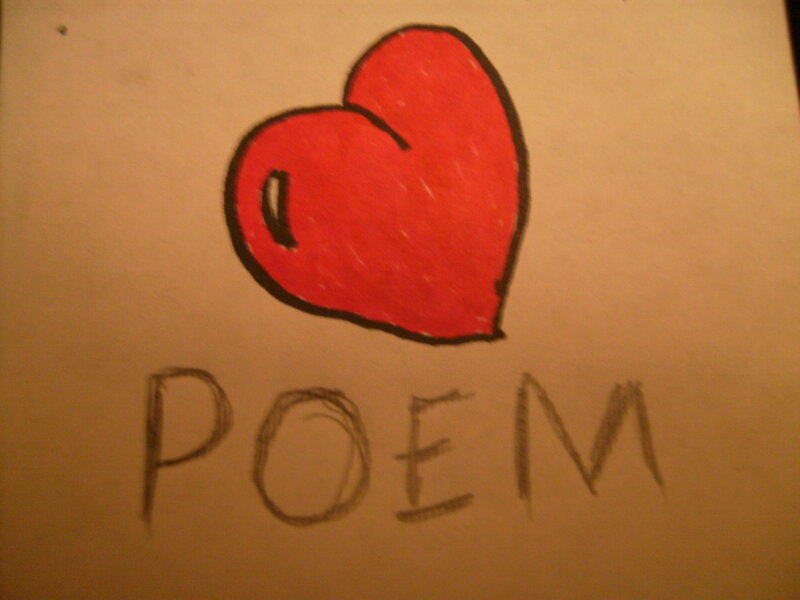 (For instance, what if he kisses his mother on the lips? What if she always talks about - and compares you to - her ex? What if he spent 3 years in a mental institute?) Fun, humorous reading, and can also be a great gag gift. Ultimate Dealbreakers: What will it take to make you break up? "Even With the Drool, You Know I'm Cute!" shirt. 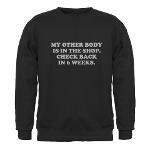 "My Other Body's in the Shop. Check back in 6 Weeks" shirt. In short, there are a great many products in the marketplace that will do a great job of showcasing your affection for both friends and family - as well as that special someone - on Valentine's day. Moreover, there's no need for you to bust your budget in order to do so. Hopefully the suggestions presented here are a great starting point for you and will allow to purchase uncommon gifts without paying unreasonable prices.